Earth (or the Earth) is the third planet from the Sun and the densest and fifth-largest of the eight planets in the Solar System. It is also the largest of the Solar System's four terrestrial planets. It is sometimes referred to as the World, the Blue Planet, or by its Latin name, Terra. 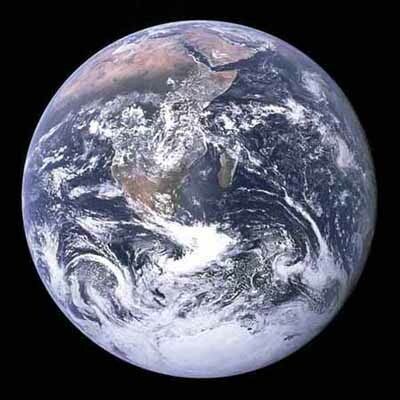 Earth is a terrestrial planet, meaning that it is a rocky body, rather than a gas giant like Jupiter. It is the largest of the four solar terrestrial planets in size and mass. Of these four planets, Earth also has the highest density, the highest surface gravity, the strongest magnetic field, and fastest rotation. It also is the only terrestrial planet with active plate tectonics. Home to millions of species including humans, Earth is currently the only astronomical body where life is known to exist. The planet formed 4.54 billion years ago, and life appeared on its surface within a billion years. Earth's biosphere has significantly altered the atmosphere and other abiotic conditions on the planet, enabling the proliferation of aerobic organisms as well as the formation of the ozone layer which, together with Earth's magnetic field, blocks harmful solar radiation, permitting life on land. The physical properties of the Earth, as well as its geological history and orbit, have allowed life to persist during this period. The planet is expected to continue supporting life for at least another 500 million years. Earth's outer surface is divided into several rigid segments, or tectonic plates, that migrate across the surface over periods of many millions of years. About 71% of the surface is covered with salt water oceans, the remainder consisting of continents and islands which together have many lakes and other sources of water contributing to the hydrosphere. Liquid water, necessary for all known life, is not known to exist in equilibrium on any other planet's surface. Earth's poles are mostly covered with solid ice (Antarctic ice sheet) or sea ice (Arctic ice cap). 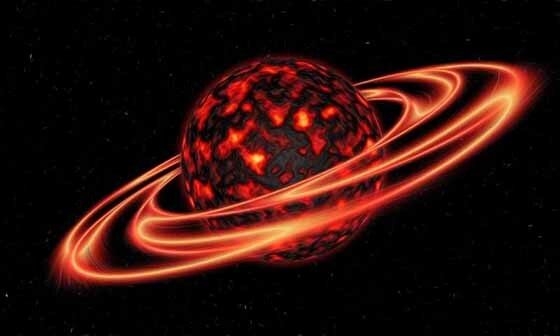 The planet's interior remains active, with a thick layer of relatively solid mantle, a liquid outer core that generates a magnetic field, and a solid iron inner core. Earth interacts with other objects in space, especially the Sun and the Moon. At present, Earth orbits the Sun once every 366.26 times it rotates about its own axis, which is equal to 365.26 solar days, or one sidereal year. The Earth's axis of rotation is tilted 23.4¡ away from the perpendicular of its orbital plane, producing seasonal variations on the planet's surface with a period of one tropical year (365.24 solar days). Earth's only known natural satellite, the Moon, which began orbiting it about 4.53 billion years ago, provides ocean tides, stabilizes the axial tilt and gradually slows the planet's rotation. Between approximately 3.8 billion and 4.1 billion years ago, numerous asteroid impacts during the Late Heavy Bombardment caused significant changes to the greater surface environment. Scientists have been able to reconstruct detailed information about the planet's past. The earliest dated Solar System material was formed 4.5672 ± 0.0006 billion years ago, and by 4.54 billion years ago (within an uncertainty of 1%) the Earth and the other planets in the Solar System had formed out of the solar nebula - a disk-shaped mass of dust and gas left over from the formation of the Sun. This assembly of the Earth through accretion was thus largely completed within 10Ð20 million years. Initially molten, the outer layer of the planet Earth cooled to form a solid crust when water began accumulating in the atmosphere. The Moon formed shortly thereafter, 4.53 billion years ago. The current consensus model for the formation of the Moon is the giant impact hypothesis, in which the Moon was created when a Mars-sized object (sometimes called Theia) with about 10% of the Earth's mass impacted the Earth in a glancing blow. In this model, some of this object's mass would have merged with the Earth and a portion would have been ejected into space, but enough material would have been sent into orbit to coalesce into the Moon. Outgassing and volcanic activity produced the primordial atmosphere of the Earth. Condensing water vapor, augmented by ice and liquid water delivered by asteroids and the larger proto-planets, comets, and trans-Neptunian objects produced the oceans. The newly formed Sun was only 70% of its present luminosity, yet evidence shows that the early oceans remained liquid - a contradiction dubbed the faint young Sun paradox. A combination of greenhouse gases and higher levels of solar activity served to raise the Earth's surface temperature, preventing the oceans from freezing over. By 3.5 billion years ago, the Earth's magnetic field was established, which helped prevent the atmosphere from being stripped away by the solar wind. Two major models have been proposed for the rate of continental growth: steady growth to the present-day and rapid growth early in Earth history. Current research shows that the second option is most likely, with rapid initial growth of continental crust followed by a long-term steady continental area. On time scales lasting hundreds of millions of years, the surface continually reshaped as continents formed and broke up. The continents migrated across the surface, occasionally combining to form a supercontinent. Roughly 750 million years ago (Ma), one of the earliest known supercontinents, Rodinia, began to break apart. The continents later recombined to form Pannotia, 600Ð540 Ma, then finally Pangaea, which broke apart 180 Ma. The snowball-Earth episodes are proposed to have occurred before the sudden radiation of multicellular bioforms, known as the Cambrian explosion. The most recent snowball episode may have triggered the evolution of multicellularity. Another, much earlier and longer snowball episode, the Huronian glaciation, which would have occurred 2400 to 2100 Mya, may have been triggered by the first appearance of oxygen in the atmosphere, the "Great Oxygenation Event". A team of scientists led by researchers from Caltech report in this week's issue of the journal Nature that the rocks on which much of a theory on how the "Snowball Earth" ice age ended was based were formed millions of years after the ice age ended, and were formed at temperatures so high there could have been no living creatures associated with them. The Great Oxygenation Event (GOE), also called the Oxygen Catastrophe or Oxygen Crisis or Great Oxidation, was the biologically induced appearance of free oxygen (O2) in Earth's atmosphere. Geological, isotopic, and chemical evidence suggest this major environmental change happened around 2.4 billion years ago (2.4 Ga). Cyanobacteria, which appeared about 200 million years before the GOE, began producing oxygen by photosynthesis. Before the GOE, any free oxygen they produced was chemically captured by dissolved iron or organic matter. The GOE was the point when these oxygen sinks became saturated and could not capture all of the oxygen that was produced by cyanobacterial photosynthesis. After the GOE the excess free oxygen started to accumulate in the atmosphere. Oxygen may have been accumulating in Earth's atmosphere hundreds of millions of years earlier than we thought. An international team has made the claim in Nature magazine after studying the oldest soils on Earth. The researchers say elements in the three-billion-year-old material show evidence for oxidative weathering. This is some 700 million years before the Great Oxidation Event when other geological data points to a dramatic rise in free O2 in the atmosphere. At present, Earth provides the only example of an environment that has given rise to the evolution of life. Highly energetic chemistry is believed to have produced a self-replicating molecule around 4 billion years ago and half a billion years later the last common ancestor of all life existed. The development of photosynthesis allowed the Sun's energy to be harvested directly by life forms; the resultant oxygen accumulated in the atmosphere and formed a layer of ozone (a form of molecular oxygen [O3]) in the upper atmosphere. The incorporation of smaller cells within larger ones resulted in the development of complex cells called eukaryotes. True multicellular organisms formed as cells within colonies became increasingly specialized. Aided by the absorption of harmful ultraviolet radiation by the ozone layer, life colonized the surface of Earth. Just as species are believed to have evolved over time, the individual molecules that form the basis of life also likely developed in response to natural selection, scientists say. Life on Earth first bloomed around 3.7 billion years ago, when chemical compounds in a "primordial soup " somehow sparked into life, scientists suspect. But what turned sterile molecules into living, changing organisms? That's the ultimate mystery. By studying the evolution of not just life, but life's building blocks as well, researchers hope to come closer to the answer. The "Snowball Earth" idea that the planet was coated in ice for millions of years might help explain the emergence of complex animals, some scientists say. The Snowball Earth hypothesis suggests the planet was covered from pole to pole with a thick sheet of ice, perhaps more than once, for millions of years at a time. Supporters of this proposal suggest the glaciations, which would have been the most severe in Earth history, occurred between roughly 750 million and 635 million years ago. Life may have survived a cataclysmic global freeze some 700 million years ago in pockets of open ocean. Researchers claim to have found evidence in Australia that turbulent seas still raged during the period, where microorganisms may have clung on for life. 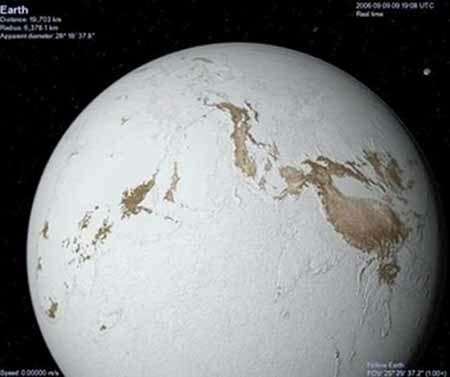 Conditions on what is dubbed "Snowball Earth" were so harsh that most life is thought to have perished. Following the Cambrian explosion, about 535 Ma, there have been five major mass extinctions. The most recent such event was 65 Ma, when an asteroid impact triggered the extinction of the (non-avian) dinosaurs and other large reptiles, but spared some small animals such as mammals, which then resembled shrews. Over the past 65 million years, mammalian life has diversified, and several million years ago an African ape-like animal such as Orrorin tugenensis gained the ability to stand upright. This enabled tool use and encouraged communication that provided the nutrition and stimulation needed for a larger brain, which allowed the evolution of the human race. The development of agriculture, and then civilization, allowed humans to influence the Earth in a short time span as no other life form had, affecting both the nature and quantity of other life forms. The present pattern of ice ages began about 40 Ma and then intensified during the Pleistocene about 3 Ma. High-latitude regions have since undergone repeated cycles of glaciation and thaw, repeating every 40Ð100,000 years. The last continental glaciation ended 10,000 years ago. Planetary scientists have found strong evidence that suggests the Earth has an inner and an outer core. The inner core is believed to be solid, while the outer core is made up of molten material. Prior evidence has also indicated that the entire core was once liquid, but as the interior cooled, the innermost part began to crystallize. It is at this point that scientists disagree - some suggest the start of solidification began as far back as 2.5 billion years ago. Others believe it was much more recent - perhaps as recent as just 500 million years ago. In this new effort, the researchers have found evidence that supports the latter theory. The interior of the Earth, like that of the other terrestrial planets, is divided into layers by their chemical or physical (rheological) properties, but unlike the other terrestrial planets, it has a distinct outer and inner core. The outer layer of the Earth is a chemically distinct silicate solid crust, which is underlain by a highly viscous solid mantle. The crust is separated from the mantle by the Mohorovicic discontinuity, and the thickness of the crust varies: averaging 6 km under the oceans and 30Ð50 km on the continents. The crust and the cold, rigid, top of the upper mantle are collectively known as the lithosphere, and it is of the lithosphere that the tectonic plates are comprised. Beneath the lithosphere is the asthenosphere, a relatively low-viscosity layer on which the lithosphere rides. Important changes in crystal structure within the mantle occur at 410 and 660 kilometers below the surface, spanning a transition zone that separates the upper and lower mantle. Beneath the mantle, an extremely low viscosity liquid outer core lies above a solid inner core. The inner core may rotate at a slightly higher angular velocity than the remainder of the planet, advancing by 0.1-0.5° per year. Japanese scientists believe they have established the identity of a "missing element" within the Earth's core. They have been searching for the element for decades, believing it makes up a significant proportion of our planet's centre, after iron and nickel. Now by recreating the high temperatures and pressures found in the deep interior, experiments suggest the most likely candidate is silicon. The discovery could help us to better understand how our world formed. Scientists say they have identified a remarkable new feature in Earth's molten outer core. They describe it as a kind of "jet stream" - a fast-flowing river of liquid iron that is surging westwards under Alaska and Siberia. The moving mass of metal has been inferred from measurements made by Europe's Swarm satellites. This trio of spacecraft are currently mapping Earth's magnetic field to try to understand its fundamental workings. The scientists say the jet is the best explanation for the patches of concentrated field strength that the satellites observe in the northern hemisphere. A band of molten iron is churning slowly deep inside Earth, much in the same way as a jet stream, a new study finds. Scientists discovered the so-called molten jet stream while analyzing data from a trio of European satellites, called Swarm. The satellites launched in 2013 with the goal of studying Earth's magnetic field. In this case, Swarm's observations helped create a view akin to an X-ray of the planet, the researchers said. The future of the planet is closely tied to that of the Sun. As a result of the steady accumulation of helium at the Sun's core, the star's total luminosity will slowly increase. The luminosity of the Sun will grow by 10% over the next 1.1 Gyr (1.1 billion years) and by 40% over the next 3.5 Gyr. Climate models indicate that the rise in radiation reaching the Earth is likely to have dire consequences, including the loss of the planet's oceans. The Earth's increasing surface temperature will accelerate the inorganic CO2 cycle, reducing its concentration to levels lethally low for plants (10 ppm for C4 photosynthesis) in approximately 500 million to 900 million years. The lack of vegetation will result in the loss of oxygen in the atmosphere, so animal life will become extinct within several million more years. After another billion years all surface water will have disappeared and the mean global temperature will reach 70 °C (158 ¡F). The Earth is expected to be effectively habitable for about another 500 million years from that point, although this may be extended up to 2.3 billion years if the nitrogen is removed from the atmosphere. Even if the Sun were eternal and stable, the continued internal cooling of the Earth would result in a loss of much of its CO2 due to reduced volcanism, and 35% of the water in the oceans would descend to the mantle due to reduced steam venting from mid-ocean ridges. The Sun, as part of its evolution, will become a red giant in about 5 Gyr. Models predict that the Sun will expand out to about 250 times its present radius, roughly 1 AU (150,000,000 km). Earth's fate is less clear. As a red giant, the Sun will lose roughly 30% of its mass, so, without tidal effects, the Earth will move to an orbit 1.7 AU (250,000,000 km) from the Sun when the star reaches it maximum radius. The planet was therefore initially expected to escape envelopment by the expanded Sun's sparse outer atmosphere, though most, if not all, remaining life would have been destroyed by the Sun's increased luminosity (peaking at about 5000 times its present level). However, a 2008 simulation indicates that Earth's orbit will decay due to tidal effects and drag, causing it to enter the red giant Sun's atmosphere and be vaporized. The gaseous layer that wraps around Earth reaches up to 630,000 kilometers away, or 50 times the diameter of our planet Where our atmosphere merges into outer space, there is a cloud of hydrogen atoms called the geocorona. One of the spacecraft instruments, SWAN, used its sensitive sensors to trace the hydrogen signature and precisely detect how far the very outskirts of the geocorona are. These observations could be done only at certain times of the year, when the Earth and its geocorona came into view for SWAN. For planets with hydrogen in their exospheres, water vapor is often seen closer to their surface. That is the case for Earth, Mars and Venus. An international team of scientists found fossilized remains and evidence of large-scale tectonic plate shifts as part of one of the first extensive surveys of the region. The discovery of microscopic shells of organisms that lived in warm shallow seas, and spores and pollen from land plants, reveal that the geography and climate of Zealandia was dramatically different in the past. You think you know your seven continents? Think again, as there's a new contender hoping to join that club. Say hello to Zealandia, a huge landmass almost entirely submerged in the southwest Pacific. It's not a complete stranger, you might have heard of its highest mountains, the only bits showing above water: New Zealand. Scientists say it qualifies as a continent and have now made a renewed push for it to be recognized as such. In a paper published in the Geological Society of America's Journal, researchers explain that Zealandia measures five million sq km (1.9m sq miles) which is about two thirds of neighboring Australia. Scientists have identified the creature that gave the Earth its first breath of fresh, clean air and made life possible for everything ranging from ardvaarks to Olympic athletes and zebra finches. It was a moss. The drama unfolded more than 400 million years ago and there are no surviving witnesses. The episode had to be reconstructed in computer models from the testimony of rocks, the fossils in the sea and the few spores preserved in ancient sediments. Look at Earth compared to other rocky planets in the neighborhood, and the first thing that would likely jump out is that there's A LOT of water. So how did 70 percent of our planet's surface become covered in this essential life ingredient? That question is the subject of lively scientific debate, it turns out. There are two prevailing theories: One is that the Earth held onto some water when it formed, as there would have been ice in the nebula of gas and dust (called the proto-solar nebula) that eventually formed the sun and the planets about 4.5 billion years ago. Some of that water has remained with the Earth, and might be recycled through the planet's mantle layer, according to one theory. The second theory holds that the Earth, Venus, Mars and Mercury would have been close enough to that proto-solar nebula that most of their water would have been vaporized by heat; these planets would have formed with little water in their rocks. In Earth's case, even more water would have been vaporized when the collision that formed the moon happened. In this scenario, instead of being home-grown, the oceans would have been delivered by ice-rich asteroids, called carbonaceous chondrites. Two continent-size blobs of hot - and possibly molten - rock can be found deep underground, about halfway to the center of the Earth, according to a new study. These curious structures - each of which is so large that it would be 100 times taller than Mount Everest - could be made up of materials that may shed light on how the Earth formed, the researchers said. One of the blobs is located beneath the Pacific Ocean, and the other can be found beneath the Atlantic. These underground structures start where the Earth's mantle meets the core, but they send "plumes" up through the rock like a Lava Lamp, the researchers said. Scientists now think these masses differ from the surrounding rock in more than just temperature. They're also "compositionally distinct," meaning they could contain materials not typically found in the rest of the Earth's mantle. Yet even some of the most basic information about the blobs is still a mystery. Water covers more than two-thirds of Earth's surface, but its exact origins are still something of a mystery. Scientists have long been uncertain whether water was present at the formation of the planet, or if it arrived later, perhaps carried by comets and meteorites. Now researchers from the University of Hawaii at Manoa, using advanced ion-microprobe instrumentation, have found that rocks from Baffin Island in Canada contain evidence that Earth's water was a part of our planet from the beginning. A reassessment of ancient rocks has led scientists to estimate that Earth's inner core started to form earlier than was previously thought, around 1.3 billion years ago. As it started to freeze, the core began generating a bigger magnetic field, which continues to today. Earth's active core contrasts sharply with that of our neighbor Mars, whose strong early magnetic field died around four billion years ago. Our planet's magnetic field is generated deep in the planet by the turbulent motion of the electrically conducting molten iron of the outer core. We may have to revise our ideas about the core yet again. It aligns compass needles north-south, but also protects Earth from the solar storms that the Sun throws out relentlessly.